Basal cell carcinoma of the skin is presented as pearly lesion with vascular surface ( telangiectasia). The lesion is papule in nature and maybe bleeding or ulcerating and affecting the area exposed to the sun. 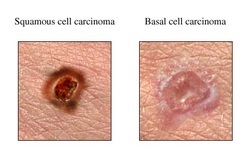 Basal cell carcinoma is the commonest skin cancer. Basal cell carcinoma consists of multiple pattern of growth which involve cystic basal cell carcinoma, trabecular basal cell carcinoma and nodular basal cell carcinoma. Basal cell carcinoma presented with cluster of tumor cells with dark blue nuclei. The tumor cells arise from the basal cells of the epidermis. The tumor cells will invade the dermis. Basal cell carcinoma is rarely metastasis in comparison with squamous cell carcinoma of the skin. The treatment option of basal cell carcinoma of the skin may include surgical excision. The common causes of basal cell carcinoma are excessive exposure to the ultraviolet light ( sunlight), genetical disorder which affect the DNA repair mechanism ( xeroderma pigmentosum), immunosuppression and individual with a fair skin. 1.Ramachandran, Sudarshan, Anthony A. Fryer, Andrew G. Smith, John T. Lear, Bill Bowers, Christopher E. M. Griffiths, Peter W. Jones, and Richard C. Strange. “Basal Cell Carcinoma.” Cancer 89, no. 5 (2000): 1012–1018. doi:10.1002/1097-0142(20000901)89:5<1012::AID-CNCR10>3.0.CO;2-O. 2.Wong, C S M, R C Strange, and J T Lear. “Basal Cell Carcinoma.” BMJ : British Medical Journal 327, no. 7418 (October 4, 2003): 794–798.